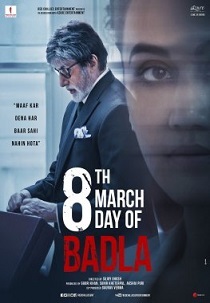 Review Summary: 'Badla' is fun, surprising and twisted. Don't miss it! A slick but predictable thriller with solid performances. Naina Sethi is 'Businesswoman of the Year' but she's implicated in a murder. Her lawyer has sent Badal Gupta who has never lost a case and he's helping Naina prove her innocence. An official remake of the Spanish film 'The Invisible Guest' on Netflix, this film keeps you involved. Entangles Your Mind-Wires, Leaving You With A Mini-Stroke!